Mavic’s iconic yellow cars and motos have been the saviors of countless stranded cyclists in the biggest races all over the world. When the hiss of a punctured tire or clattering of gears signals a serious mechanical problem, cyclists everywhere turn to Mavic. Within moments, one of the world’s best professional race mechanics jumps out of a bright yellow car or off an iconic yellow moto to help get the riders moving again. 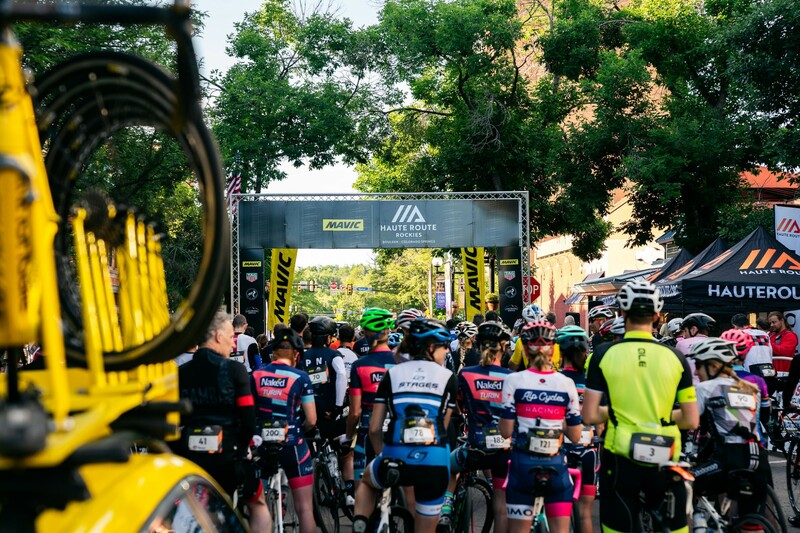 For seven days in June, riders at the Mavic Haute Route Rockies will experience the same professional level of support as ProTour riders in the sport’s most prestigious races. Cyclists have relied on Mavic cycling components since 1889, but it wasn’t until 1973 that the concept of ‘neutral race support’ was born. During Paris-Roubaix that year the company’s president, Bruno Gormand, lent his own vehicle to a cycling team when their car broke down. 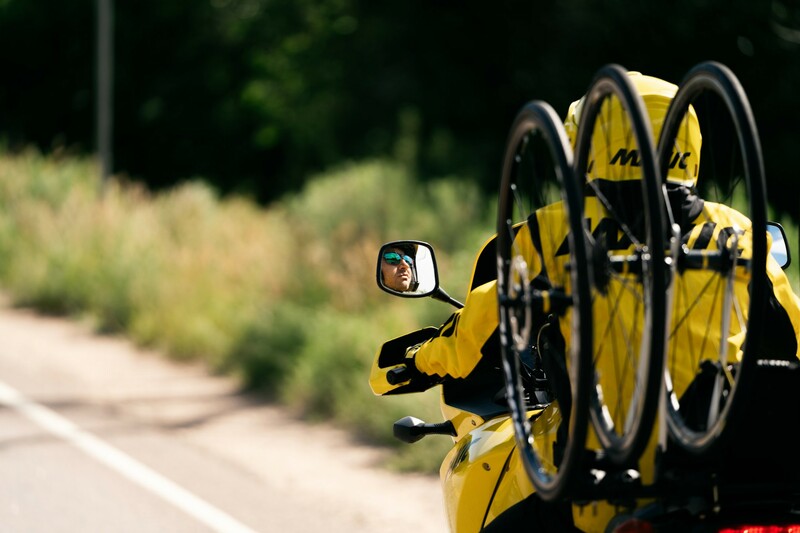 Mavic’s mechanics and vehicles have been supporting cyclists – regardless of team affiliation – ever since. For the 2018 Mavic Haute Route Rockies there are two cars and one moto on the route every day, carrying 20 spare wheels. There are another 10 sets of wheels and a bike shop’s worth of tools in their yellow sprinter van. You have Campy/Shimano/SRAM/10-speed/11-speed? No problem, they’ll get you going again. The six spare bikes mounted to the cars are there to get riders back on the road when a quick repair is not possible. They are the same bikes used for World Tour races like the Amgen Tour of California and Tour de France. One of the mechanics servicing bikes at the 2018 Mavic Haute Route Rockies just arrived from working the Dauphine Libere race in France, and his next assignment is the Tour de France. Racing fans may remember Maxime Ruphy. During Stage 9 of the 2017 Tour de France he was the mechanic hanging out the window of the Mavic support car to work on Rigoberto Uran bent rear derailleur. In the finale of the stage, there was no way to repair the derailleur hanger and no time to stop for a swap to a spare bike. Ruphy was able to stop the chain from skipping and give Uran one good gear – the 11-tooth cog. Coming into the final straightaway, that was the gear Uran needed to win the sprint for the stage win! Keep your bike clean. Cleaning your bike isn’t just about aesthetics. The process of cleaning your bike gives you the opportunity to inspect the frame, wheels, brakes, and components as you go. And when you clean your bike frequently, you’re more likely to notice when something changes. Replace parts early. While you might get every ounce of life out of tires or brake pads while training, replace wear items (tires, chain, brake pads, etc.) a few weeks before goal events. That gives you enough time to ensure the parts are installed and working properly. Be patient. Mavic’s priorities are to get you back on the road safely and quickly. Some repairs take some time to complete. Use the time to get a drink and eat some food so you’re ready to go when your bike is. Don’t let perfect be the enemy of good. While Mavic can often get your bike back on the road in perfect shape, remember that many a race has been won on a bike that’s not perfect.